Romanticism and legends take a back seat, with Dutch construction workers finding their pot of gold at the end of a drain pipe. 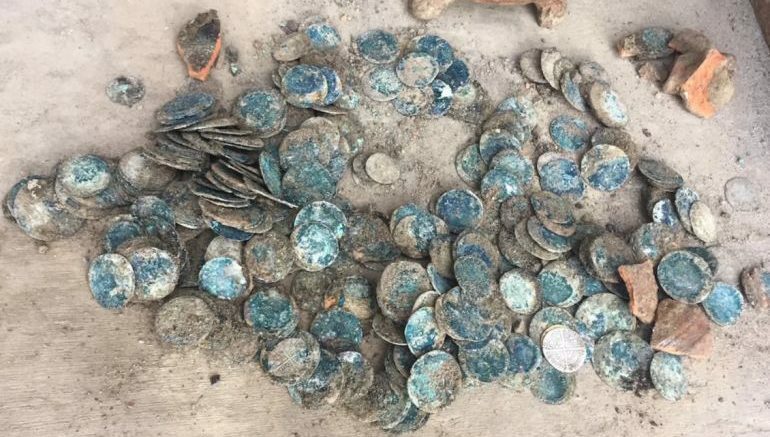 This fascinating find in question entails a glazed cooking pot filled with a whopping 500 coins – though only 12 of them are gold while the rest are of silver pedigree. The discovery in itself transpired when these workers (employees of Oasen, a drinking-water company) were involved in laying down pipes along particular sections at the town of Hoef en Haag, in Utrecht. Quite conscientiously, after finding their treasure hoard, the workers opted to contact Utrecht’s archaeological office. And an initial assessment of the archaeologists from Omgevingsdienst Regio Utrecht (Environment Service Region Utrecht) revealed how the pot additionally also contained the remnants of textile, which probably alludes to how the coins were kept inside separate pouches. The coins in themselves, possibly dating back to the late 15th century, have a range of markings and imagery, including that of King Henry VI of England (whose reign also coincided with the height of medieval English power in France), Pope Paul II (who hailed from the noble Barbo family based in Slovenia), and David of Burgundy (who was bishop of Utrecht and an illegitimate son of the Duke of Burgundy). Every coin in this treasure is a story in precious metal,” de Boer told RTV Utrecht. “Every gentleman gave out his ‘business card’ by way of a coin, and therefore, there is a lot to discover. Now beyond their composition, the coins may prove to be valuable for discerning the history of the region during the 14th and 15th centuries. For example, analyzing the nature of artistry on the coins might allow for a better comprehension of the history of the Burgundian Netherlands (or Bourgondische Nederlanden in Dutch), a late-medieval European state that was composed of a number of fiefs ruled in personal union by the House of Valois-Burgundy (derived from the French royal house) and their Habsburg heirs. The area of the realm (that existed from 1384 to 1482 AD) encompassed numerous parts and parcels of modern-day Belgium, the Netherlands, Luxembourg, and even areas of northern France. On a more specific note, the archaeologists are also looking forth to unravel what happened to the medieval city of Hagestein after it fell in a siege in 1405. Lastly, while the researchers are carrying out their study and assessments, the coins are expected to be returned soon to their would-be owners, in accordance with the Dutch law. These new owners will include the project developer Oasen and the people who own the land where the coins were located.